Consultant/Senior Decision maker to commence NIV. NIV machine (Bipap Focus in CUH) + tube + CO2 exhalation port + mask + head-cap. 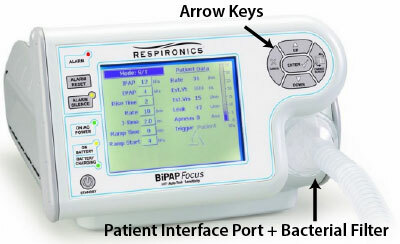 On the Bipap focus machine, the O2 tubing can be attached into the port on the face mask or beside the exhalation port. Set EPAP at 4 – 5 cm H2O and IPAP at 10 cm H2O. Set back-up breathing frequency to 8 – 10 breaths/minute. Select appropriate size mask (full face in preference to nasal) to fit patient. Hold mask in place to allow patient to familiarize themselves. Commence NIV, holding mask in place initially. Secure mask in place with straps/headgear to prevent leaks – do not attach too tightly! Reassess patient after a few minutes. Check for leaks and refit mask if necessary. Add O2 to maintain SpO2 >85%. Instruct patient how to remove the mask and summon help. Increase IPAP gradually up to about 12 - 15 cmH2O over 1 hr. Clinical assessment and, if appropriate, check ABG at 1 hour. If procedure fails, institute alternative management plan.